US representatives Mike Thompson and Gene Green recently introduced a new bill to the House of Representatives that is meant to curb the exportation of e-waste to developing countries around the world. E-Waste, or Electronic Waste, means a variety leftover computer parts, screens, printers, and other electronic items that can be toxic when dumped into a landfill. Not only is e-waste a problem in other countries, but a big problem here in the US. Electronic items that are improperly disposed of can end up seeping toxic chemicals into our ground soil and elsewhere. So, why is there so much e-waste around everywhere? Just look at the rate that people replace the electronics in their home. People are constantly marketed to and sold on the newest and best electronic devices - from replacing their old boxy television sets with flat screen HD-TVs to getting the best sub-woofer stereo systems available. Americans are typically very good consumers, which is one of the strengths of our economy. However, big consumption also means a large volume of waste, especially when it comes to the rapidly expanding electronic industry. So how can you prevent e-waste from ending up in the wrong place? Get in the habit of E-Cycling. But first you have to find out where all the e-waste in your home or business has ended up! How much stuff could that be? Well, according to research, about 75 percent of e-waste is currently in storage. That means that there are probably a number of old PCs, printers, scanners, VCRs, stereos, and even fax machines that are sitting around your house or office. Although they aren't hurting anyone right now, if they aren't dealt with in a responsible fashion they are more likely to get thrown out the wrong way. And that can lead to some genuine hazardous materials issues. "E-waste-connected health risks may result from direct contact with harmful materials such as lead, cadmium, chromium, brominated flame retardants or polychlorinated biphenyls (PCBs), from inhalation of toxic fumes, as well as from accumulation of chemicals in soil, water and food." Fortunately, a great deal of the current e-waste volume hasn't reached the waste stream and the landfills. Yet. 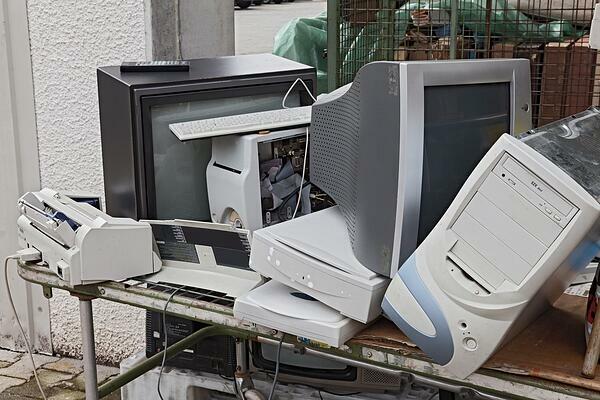 That face is that most people and businesses still have a number of e-waste 'repositories': places in their homes or offices where all of these old electronic items pile up. It could be in your basement or garage, or up in the attic. If you work in or have a business, e-waste items might end up in a storage room down the hall. The challenge, then, is to find the proper approach for e-waste removal and disposal. Recycling is the best way to properly dispose of e-waste. The 3 R's pretty much sum it up: Reduce, Reuse and Recycle. Reduce the amount of e-waste that you have by making sure your responsibly purchase good quality electronic equipment that won't need to be replaced every two months. Reuse your old electronic items that are still functioning by handing them down to someone else that could use them. Finally, make sure that those electronic items that are beyond repair are properly Recycled. This 3rd 'R' is the most difficult; many people aren't completely sure how to recycle their electronics. Beyond finding and taking your items to the proper recycling facility in your neighborhood, you can hire a responsible hauling company to handle those larger items. 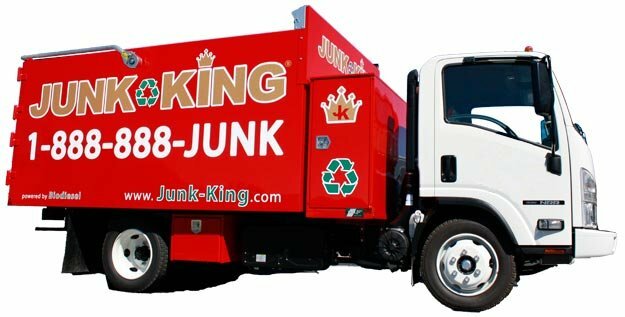 Junk King has an expertise in properly recycling a variety of electronic items to make sure they don't end up in a landfill. Ready to remove those old electronics? It’s as simple as 1, 2, 3. You make an appointment by booking online above or by calling 1.888.888.JUNK (5865). Our professional and insured e-waste removal team will show up at your home or office and we'll call 15 minutes before we arrive on site. Once there, we’ll give you a free estimate based on how much room your e-waste junk takes up in our truck. You simply show us where to go and we'll haul those items into our junk removal trucks, with no hidden fees. Simply call 1-888-888-JUNK or schedule an free on site e-waste recycling estimate today.